Bringing in some Winter fun- Here is Olaf with some snowflakes and polka dots! This bow will bring lots of fun to your sweetie's Frozen outfit. This is a double lined bow with turquoise 2.25 inch on the bottom and a 1.5 inch brown with white polka dots on top. 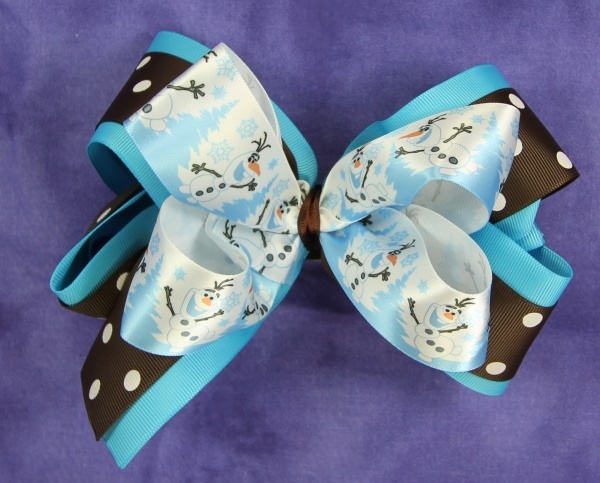 The topper bow is a satin ribbon with Olaf smiling and loving the snowflakes. Wrapped with a white grosgrain ribbon and attached to a French clip. This bow is ready for FUN FUN FUN! !